Nicolas Maduro holds a tight grip on power amid unrest in Venezuela. How Much Worse Can Venezuela Get? The country’s problems are profound and complex, with no easy answers in sight. People line up to buy basic food and household items outside a supermarket in Caracas, Venezuela, on May 27. Venezuela faces a disaster. Over the past month, food riots have broken out across the country as mostly empty supermarkets are looted. Its capital, Caracas, is now the most violent city in the world. The economy is in a tailspin, set to contract 10 percent this year. Oil production, the country’s lifeblood, has plummeted as the neglected state-owned energy sector crumbles. The government lacks the money to print its money. Inflation may top 700 percent this year. Severe medical shortages, of even the most basic equipment and medicines, may be causing thousands of deaths. In April, the government mandated a two-day workweek for state employees to save electricity. Embattled President Nicolás Maduro rules largely by decree, and dozens of political prisoners are held behind bars. The country’s problems seem so profound, complex, and unpredictable that something, it seems, has to give. But precisely because of the convoluted nature of the deepening crisis, the most likely scenario is continued stalemate between offsetting forces. Anything else may not yet be possible. The biggest obstacle to change is political: The government still holds nearly all the cards. Maduro, Hugo Chávez’s hand-picked successor, has his predecessor’s bent to concentrate power behind the chavista movement, including the military. In fact, the military is a fundamental part of his government. Almost one-third of ministries are controlled by current or former military officers. Opponents of Maduro were heartened by a sweeping electoral victory in the congressional elections last December, but since then the government has used its iron-clad grip over the executive and judicial branches to essentially render the legislature powerless. The Supreme Court, in particular, is packed with chavista loyalists. To date the court has arbitrarily blocked several National Assembly members from taking their seats, denying the opposition a critical two-thirds majority. It also deemed any attempt to free political prisoners through legislation unconstitutional and defended Maduro’s emergency powers from being struck down—despite the Venezuelan constitution explicitly giving Congress that power. At present, the opposition has put its hopes on a painstaking recall referendum process to remove Maduro from office. It has collected almost 2 million signatures, the first of several steps. But to hold on to power, the chavistas need not even defeat the referendum outright: If they simply delay the vote until January, Maduro will be replaced by his vice president, ensuring political continuity. With the National Electoral Council also directly controlled by the government, pushing back the referendum will be relatively simple. Already it has shown willingness to openly stall, invalidating hundreds of thousands of signatures—including, in a brazen move, that of Henrique Capriles, the most prominent leader of the recall effort and the opposition’s presidential candidate in the past two elections. 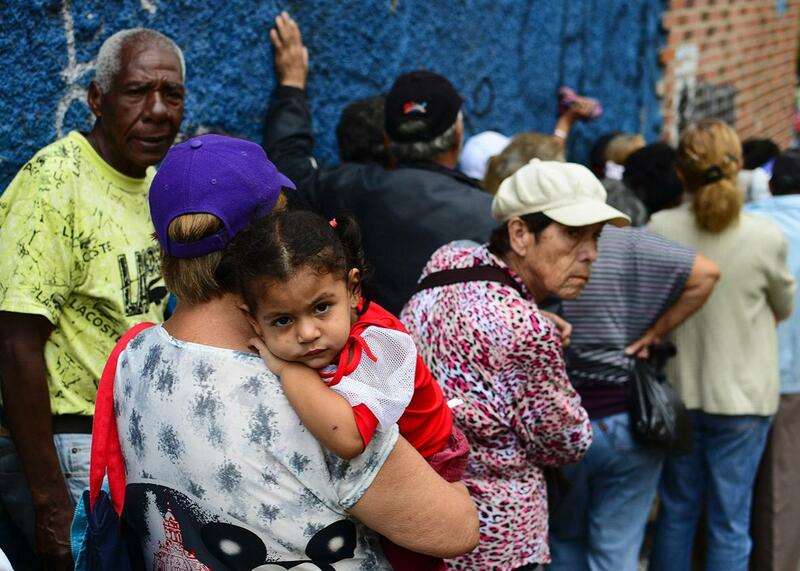 Moreover, while voters want Maduro out, the Chávez legacy will not be easy to overcome. Chavismo remains a powerful political force in the country. Even with the turmoil and terrible conditions, a quarter of the country still supports Maduro, according to a March poll, a higher approval rating than several other Latin American presidents. According to some estimates, up to 40 percent of the country still identifies as chavista—with a portion simply disapproving of Maduro. Millions of Venezuelans, many lifted out of poverty by Chávez’s expansive social programs, remain loyal to the government and distrust the opposition. Maduro’s authoritarianism may be his lock on power, but the country’s deep polarization is what ultimately protects him as the crisis worsens. His enduring support complicates the opposition’s efforts to mobilize protests, speak with one voice, and build a national consensus. And the deteriorating economy may only worsen the gridlock as anger flares and each side seeks to blame the other for the country’s problems. 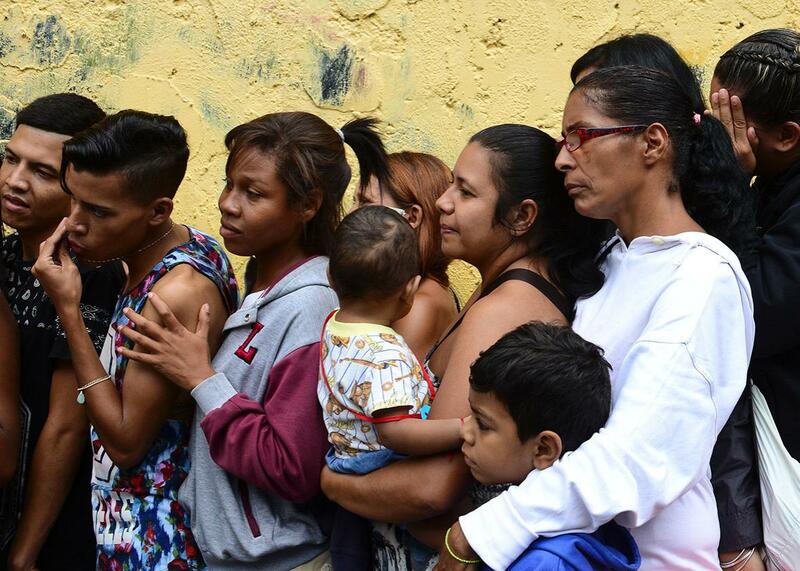 People line up outside a supermarket in Caracas on May 27. This paralysis even extends to the opposition, itself deeply fractured between moderate and radical factions. Many, including political prisoner Leopoldo López, have pushed for a more confrontational approach, while others such as Capriles have been more moderate. More than a dozen opposition parties came together during the congressional elections in December and won as a unified slate for the first time in years, but the coalition was built on little more than opposition to chavismo. As soon as votes were cast, signs of infighting returned. Today, even the idea of dialogue with the government is controversial. As a result, the opposition has been largely unable to put forward a coherent alternative plan for government and the economy. Of course, developing viable economic alternatives is challenging precisely because the crisis is so severe. While misguided economic policies are certainly to blame, as a result what remains of the economy is a deadly house of cards, where any wrong move could trigger even more widespread hunger or social upheaval. The crisis stems from utter mismanagement and massive corruption, resulting in a wide variety of economic distortions. These include strictly enforced price controls, a comically low fixed exchange rate (the currency trades on the black market at less than a hundredth the official value), subsidies on food and energy (a gallon of gas costs about 3 cents U.S.), expensive social programs, and ballooning debt. Meanwhile, falling oil prices have exacerbated an already bad situation. But as the crisis has evolved, many Venezuelans have adapted to these distortions and rely on them, at least in part, to survive. Food and other basic goods may be scarce but are often cheap when available. Sharp cuts to subsidies, reductions to social programs, and free-floating exchange rates, while all necessary, could concentrate the costs of the crisis on the most vulnerable. And defaulting on the country’s massive debt, which the government has desperately tried to avoid but most experts consider “highly likely,” would only tighten imports further—a dangerous prospect as much of domestic production is in disrepair. Of course, there are still myriad economic measures that the government can and should take to reform the economy immediately, and far-reaching cuts are inevitable. However, the eventual macroeconomic shock and adjustment will almost certainly bring even more suffering, at least in the short term. The pain caused by economic reform, however necessary, will be a bitter pill for any leaders, including the opposition. The tragedy is that the longer these changes are deferred, the harsher their eventual impacts will be. The international community has only limited leverage in Venezuela. To be sure, many have admirably taken up the cause, including an unprecedented diplomatic push by the secretary general of the Organization of American States, Luis Almagro. Among other things, he has demanded that the recall be allowed to happen this year. Last Thursday, at Almagro’s request, diplomats from across the hemisphere gathered in Washington to discuss the situation and whether to take action. The day before, John Kerry dispatched Under Secretary of State for Political Affairs Tom Shannon to Caracas to meet with Maduro and open a new round of bilateral talks, although with few tangible goals. Former presidents of Spain, the Dominican Republic, and Panama are attempting to broker talks between the government and the opposition. But diplomatic and ideological complications constrain all of these efforts. Many in Latin America, particularly on the left, would prefer to avoid criticisms of Venezuela and of Chávez’s legacy. At the same time, many Latin American governments face political problems at home, are nervous about the precedent, and fear potentially inviting criticism against them. Through all of this, Maduro, like Chávez before him, has tried to weave a narrative of spectral foreign adversaries, neoliberal interventions, and subversive plots against the people of Venezuela. As a result, any outside pressure risks provoking an explosive reaction by Maduro and being counterproductive. Since heated rhetoric in the past by the U.S. toward Chávez generally backfired—strengthening him at home and fueling his anti-imperialist narrative—diplomats are right to be cautious. So the political and economic spiral continues, with only faint hope that protests, mediation efforts, and international pressure will bring about political and economic change in the short term. The status quo is unsustainable: The human costs and suffering by Venezuelans are nothing short of a tragedy, and the pain will soon be too much to bear. But it is unclear whether Venezuela has reached rock bottom. That inflection point may well come in 2017 after Maduro is removed from office through one path or another—although the situation in Venezuela is so volatile that any predictions—this one included—should be taken with a grain of salt. When that breaking point does come—and it will—the international community must be ready to respond.